It has been reported that newly elected US President Donald Trump has nominated Neil Gorsuch, a federal appeals judge in Denver to the Supreme Court, filling the vacuum created by Late Justice Antonin Scalia who died in February last year. Neil Gorsuch, considered as an ardent textualist (like Scalia); is the son of the late Anne Gorsuch Burford, a Republican appointee of President Ronald Reagan to lead the Environmental Protection Agency. He was educated at Columbia, Harvard Law School and Oxford, and began his legal career with prestigious clerkships at the U.S. Court of Appeals for the D.C. Circuit and later at the U.S. Supreme Court. There, he clerked for retired Justice Byron White and then for Justice Anthony Kennedy. After that distinguished start, Gorsuch went on to work in private practice for nearly a decade before he did a short stint at the Department of Justice, from which President George W. Bush plucked him for a federal judgeship at the U.S. 10th Circuit Court of Appeals, where he has served since. 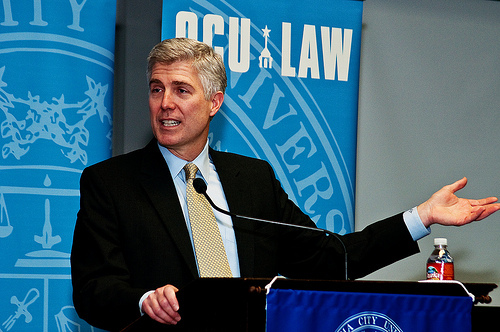 Neil Gorsuch is relatively young (turning 50 this year), and his background is filled with sterling legal and academic credentials. He was a Marshall Scholar at the University of Oxford and was a high- ranking official in the Bush Justice Department before appointment at the bench. He is celebrated as a keen legal thinker and a particularly incisive legal writer, with a flair that matches that of Justice Scalia whose seat he would be nominated to fill. His elevation to the Supreme Court would be the first time when a former clerk and his boss will share the bench. Some of the most high-profile cases which Gorsuch has heard have involved the religion clauses of the Constitution (those prohibiting the establishment of religion and creating a right to free exercise), as well as congressional statutes expanding protection for religious adherents (known as RFRA and RLUIPA). Another area in which Gorsuch has written persuasively in a manner that closely echoes Scalia relates to how to interpret criminal laws correctly, so as to avoid criminalizing potentially innocent conduct. One of Gorsuch’s most notable opinions in this area also happens to overlap with the hot-button issue of gun ownership in the US — although the case is not about the Second Amendment, and doesn’t involve anything like the typical gun-rights groups. However, Gorsuch, like Scalia, has not found to have been a friendly vote for death penalty petitioners pursuing relief from their sentences through federal habeas. Another area of the law in which Gorsuch has shown similarity to Justice Scalia is in the application (and critique) of doctrines surrounding the so-called “dormant commerce clause”. These doctrines treat the commerce clause not only as a grant of power to Congress to make laws regulating interstate commerce, but as a kind of presumptive limitation on the power of states to make laws that either unduly burden or unfairly discriminate against interstate commerce, without regard to whether Congress has ever passed a law in the relevant area. Finally, there is administrative law—the one area that seems to demonstrate some real distance between Scalia and Gorsuch. Last August, Gorsuch made real waves in the normally sleepy world of administrative law by advocating the end of a doctrine that has been tied closely to the functioning of the administrative state and the executive branch since the mid-1980s — a doctrine called Chevron deference. The basic idea behind Chevron is that, when Congress enacts a broadly worded statute whose precise contours are ambiguous, the courts should permit the federal agencies that are charged with administering the statute to enforce it in any manner that is not clearly forbidden. In short, Gorsuch definitely has a different take from Scalia on the administrative state — one that grants it less power, and so accords even more closely with the conservative conception of small government. Indeed, this is an area in which Gorsuch is plainly a thought leader, expressing judicial sentiments many conservatives with similar concerns have rarely voiced, and which even Scalia might have bristled at. But given their parallel commitments to textualism and their parallel understandings of the relative roles of agencies and courts, even this seems like a bridgeable divide between Gorsuch and the justice he might replace. Gorsuch is still a very natural choice for any Republican president to nominate as a replacement for Scalia — someone who would espouse similar principles, stand firm on similar doctrinal commitments, reach similar outcomes, and even fill a similar role as one of the court’s most articulate defenders of conservative judicial theory.